It was an easy and comfortable bus journey from Damascus to Amman. We shared the bus with some very well-behaved Jordanian school boys in football strips and arrived into the city around 8pm. After checking into our hotel – The Palace – we went to explore the evening streets that were bustling with life. The covered market was flooded with light, people bargaining for colourful vegetables. We got some fast-food: I had a chip-dog, fries in a hot-dog roll with all the usual hot-dog toppings. It was good! Supper was washed down with some incredible orange and carrot juice, made fresh in front of our eyes. 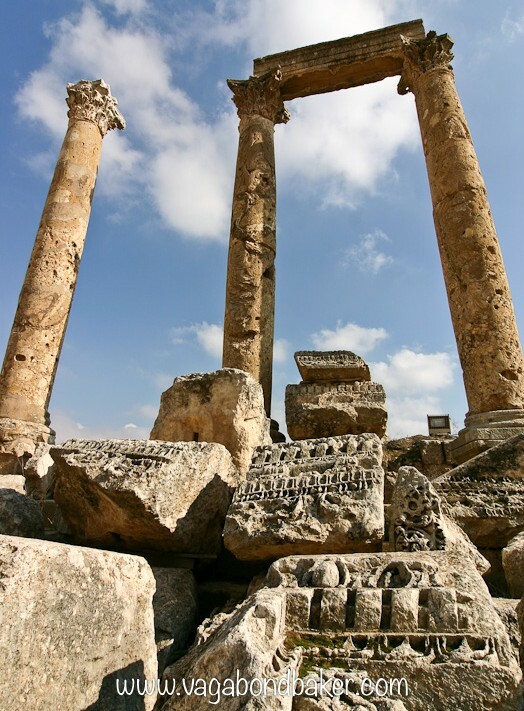 The following morning we took a taxi to the main bus station and managed to find a mini bus going to the Roman ruins of Jerash. I’d copied out the arabic for Jerash and saw it on the front of one of the buses. We had to wait for the bus to fill up but it didn’t take long. An hour later we arrived near the entrance to the site; the friendly locals on the bus told us where to get off. 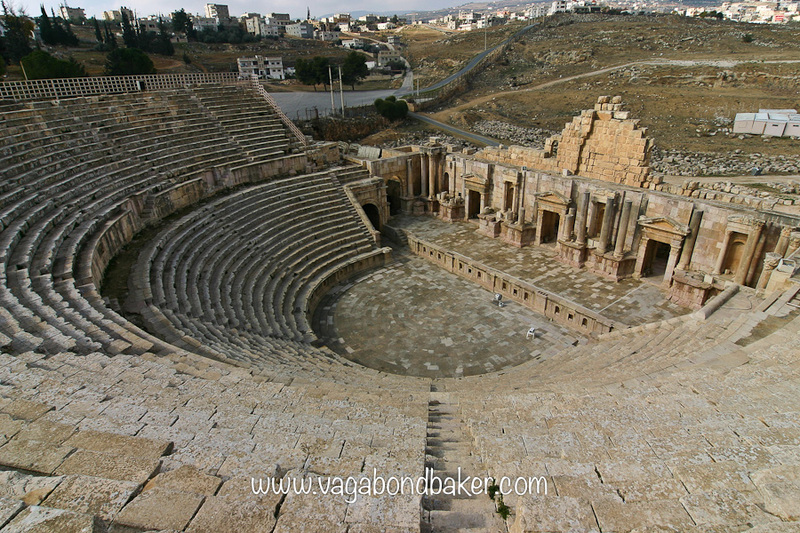 This ancient Roman city dates from around the same period as Palmyra and it was interesting to compare the two. 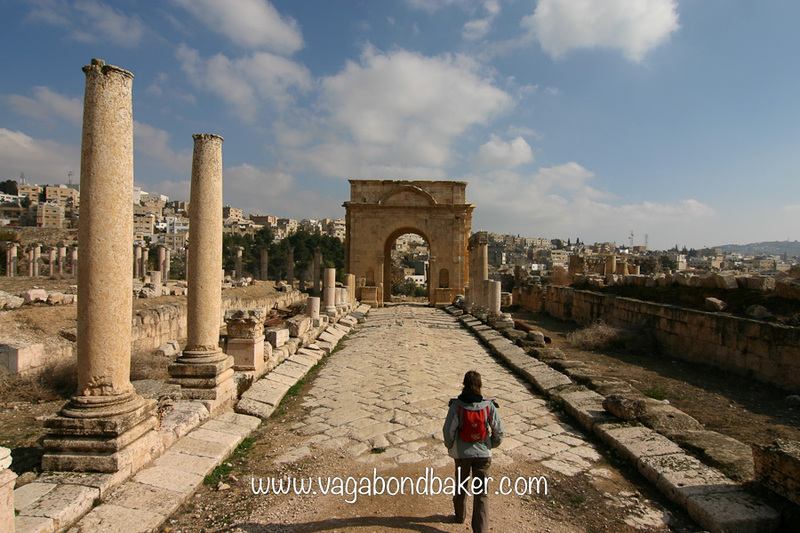 Entry to Jerash is through a grand arch, built to commemorate Emperor Hadrian’s visit in 129 AD. Through the arch is a fine example of a Roman hippodrome; alas we were visiting on a Friday, the only day there are no chariot race performances. The city then opens out into an oval colonnaded plaza, this lovely wide space has a colonnaded avenue leading off it. To the left of it a path leads to the amphitheatre which was sunk into the ground. From above we could hear the muted, surreal sound of Flower of Scotland being played on bagpipes. Having recently left a job where I had to listen to bagpipes on a daily basis, this was utterly bizarre! Surely our ears were imagining it. The sound got louder as we approached the steps and we peered over into the arena. In front of the stage stood two men in green Arab dress. 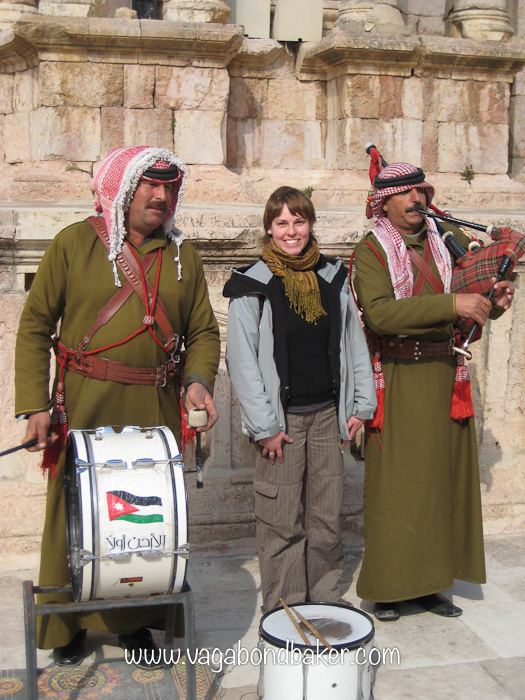 One was playing bagpipes, the other a drum. We walked down to them and they let me pose for a cheeky photo! The propylaeum (entrance) and steps up to the Temple of Artemis are spectacular, the grandeur made me feel tiny. The main street of Roman Jerash leads off from the oval plaza, looking down along its straight colonnaded length it seems to lead directly out to the modern city beyond Jerash’s walls. Remarkably, much of the street retains its original Roman pavement and you can even see where the chariot wheels have worn ruts in the stone. Details like this really bring history to life. 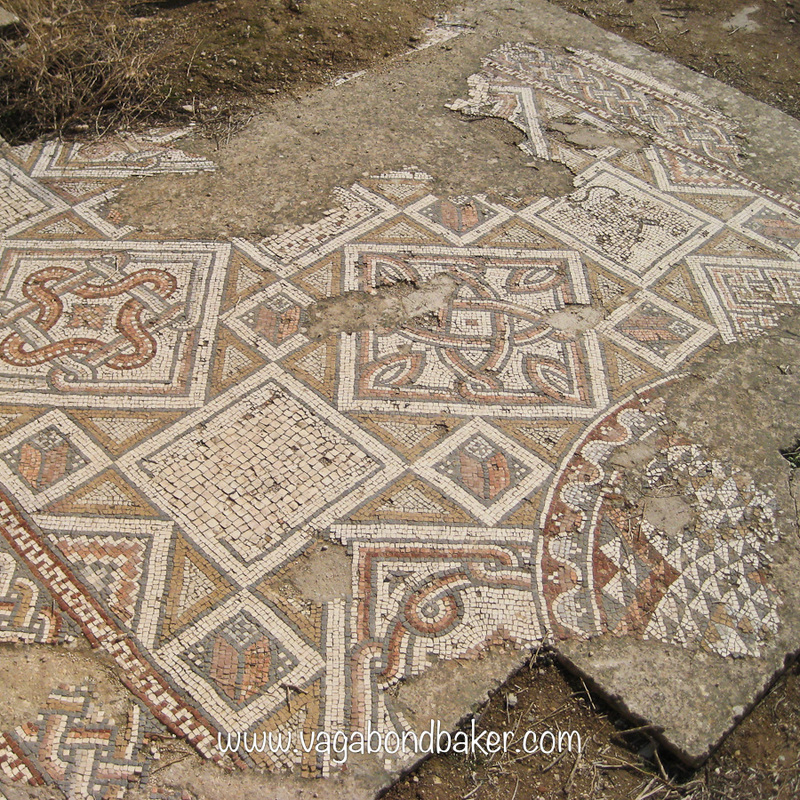 Up on the hill above the site are some ruined churches, some of which have wonderful mosaic floors. One floor was almost intact and had a beautiful design of animals and geometric patterns. 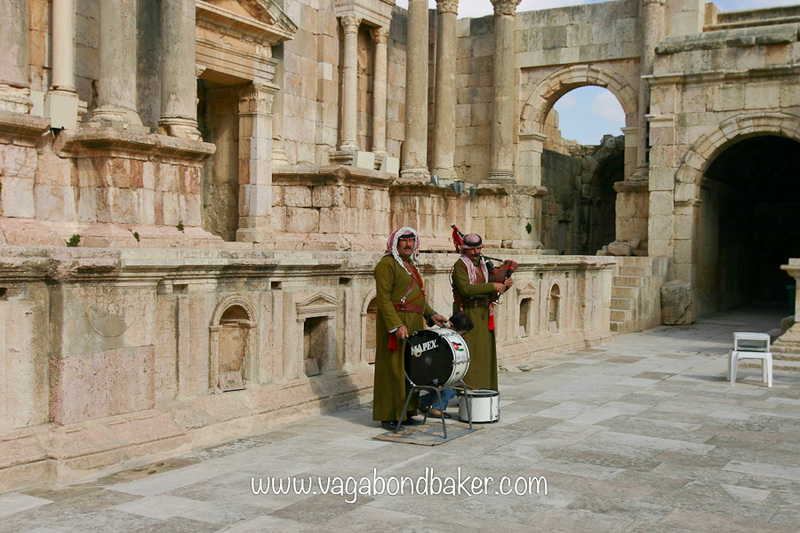 Jerash was a pleasure to explore, we virtually had the place to ourselves. Back at the spot where we were dropped off, we waited, hopefully, for a mini bus to return us to Amman. One soon turned up and we squeezed ourselves in. Chris had a toddler plonked on his lap, seat space was at a premium. We were going to visit the church in Madaba, to see the amazing Byzantine mosaic map of the Holy Land. Guide book in hand we set off to find the bus station in Amman where the buses to Madaba left from. We found the bus station but it was completely deserted, possibly because it was deepest winter and it was only open in tourist season. It was cold and raining which dampened our spirits and we gave up, which I regret completely now! 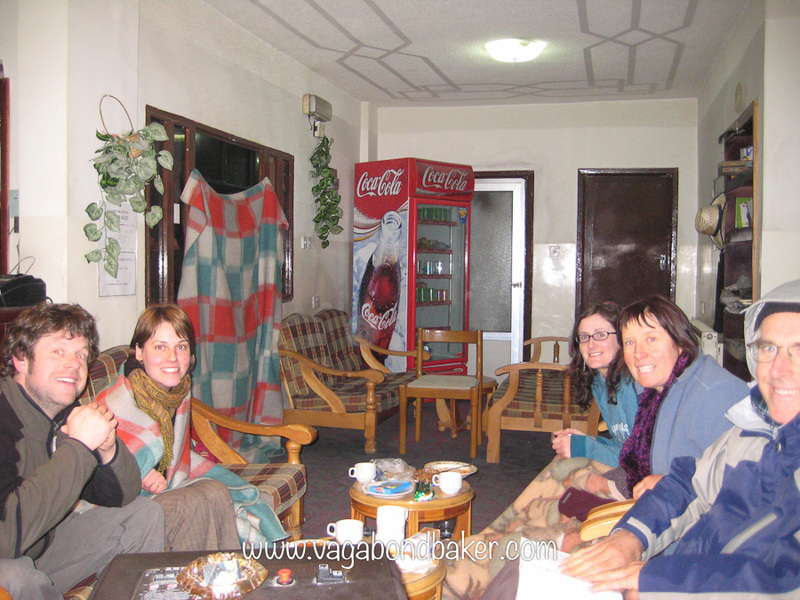 Instead we spent much of the day cosied up in the marvellous Books@Cafe reading and researching our next overland leg to Petra. 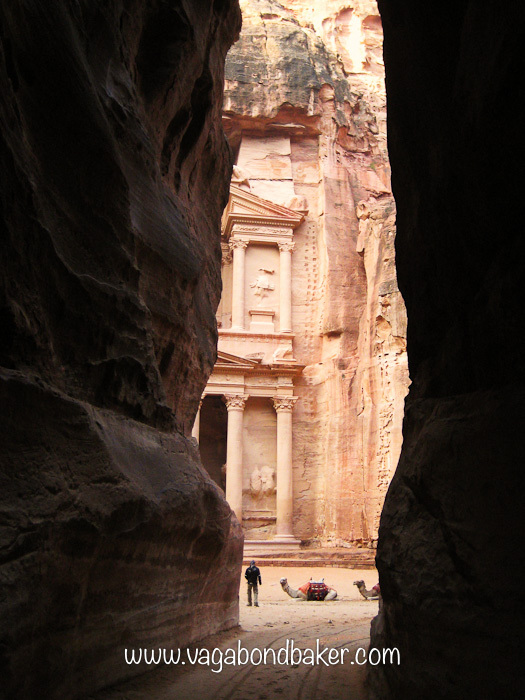 Who hasn’t dreamt of walking through that narrow rock corridor to then find themselves in front of the Treasury? It’s been seared into my dreams since Indiana Jones rode through it back in the 80s. It took two taxis (one broke down and the replacement was a farce!) and a long walk to reach the JETT bus office at ridiculous-o’clock on the Sunday morning. We rushed there with minutes to spare only for the bus to not arrive for another fifteen minutes, at least we could relax. It was a pleasant journey, just a few of us travelling. Three hours later the bus pulled into the Petra Visitor Centre car park and we stepped out into the mist and rain. It was a 2km walk up the hill from the visitor centre to the village of Wadi Musa where we found our accommodation at the marvellously named Cleopetra. Wadi Musa is quite a small place, there were a few restaurants where we could eat cheap, nourishing food. An amusing translation on a menu was a side order of ships! We rose early the next day and had a wonderfully typical Middle Eastern hotel breakfast of flatbread, cheese triangle, boiled egg, fig jam, honey, yoghurt, fruit and olives. Plenty there to pocket a few things for lunch later! We got a lift down to the visitor centre and bought a two day ticket to give us plenty of time to explore. 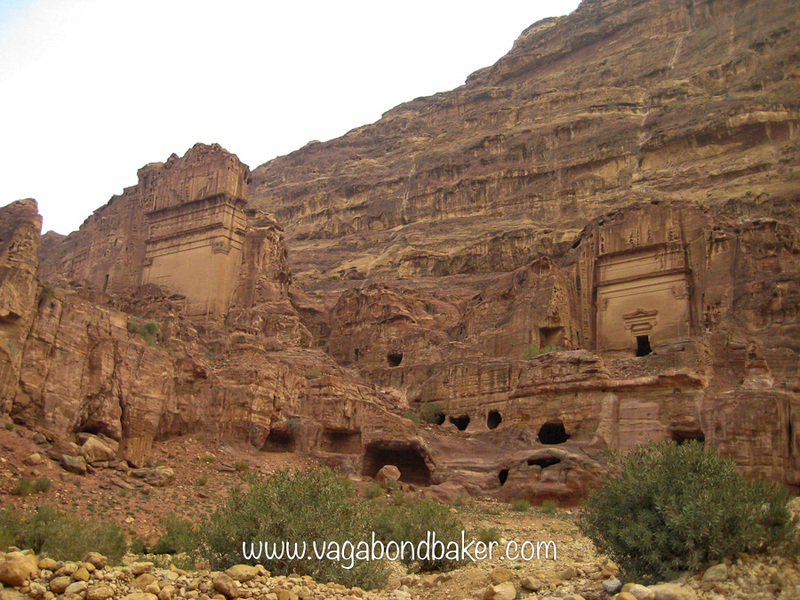 It was barely 8am when we set off along the path to the Siq, the natural entrance: a high walled gorge, to Petra. Along its length were signs of ancient use, water channels and niches. 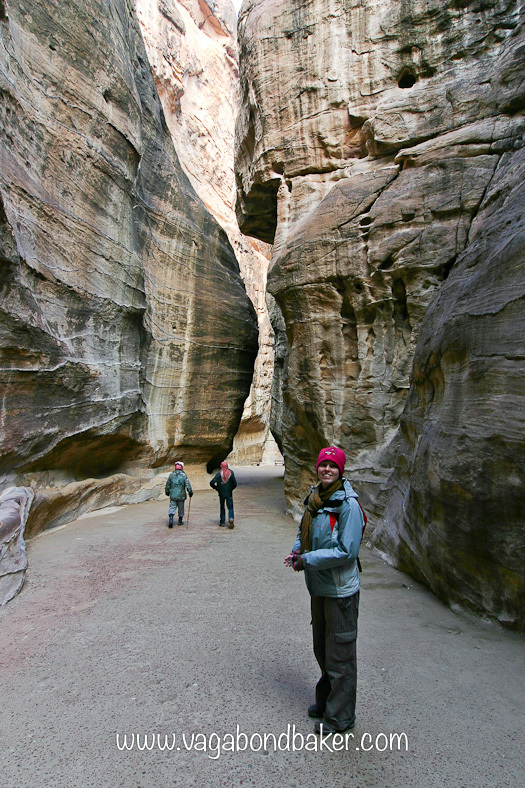 The path winds along this narrow rock passage for about a mile before it turns a final corner and you get your first glimpse of Al Khazneh: the magnificent facade carved out of the pink rock face known as the Treasury. Walking through the atmospheric Siq, your excitement builds as you know that Al Khazneh could be around the next corner, and when it does it is truly awe-inspiring. From Al Khazneh we then walked into the ancient Nabataean city along the Street of Facades, there are many tomb facades cut into the rock, all much eroded. The city was then spread out, vast and majestic, in front of us. Most of what can be seen are tomb fronts, carved into the rock with rooms behind. Some are very plain while others are quite ornate. 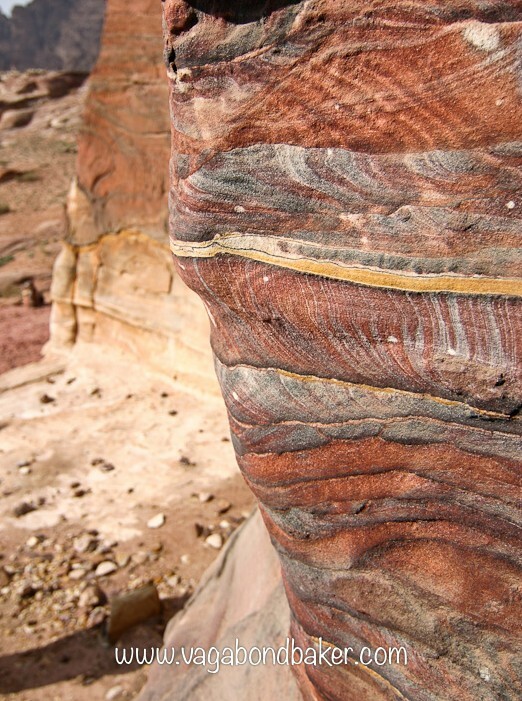 What is most remarkable is the rock itself, layers and layers of colourful sandstone. 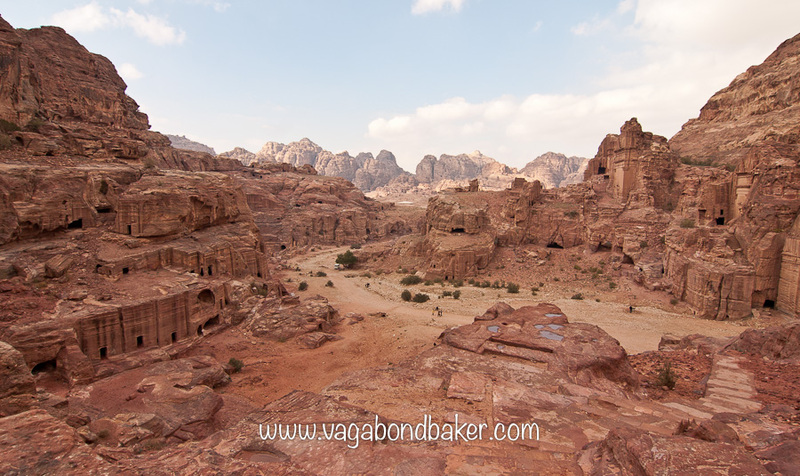 From a distance it appears red – the rose-red city of Petra – but close up there are fine layers of blue and yellow. It is so striking, and where the rock has been carved into decorative features time has eroded the sandstone and many of the carving look like they have melted, like wax. 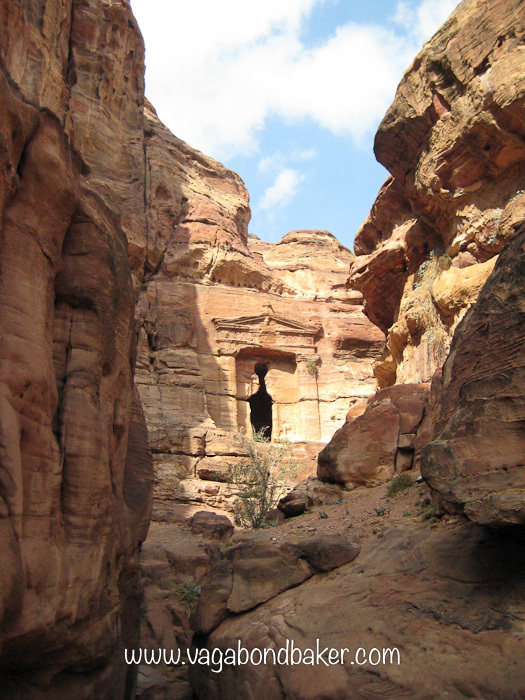 The Petra we see today is mostly from two distinct periods, the Nabataean and the Roman: the Roman overlaying the earlier Nabatean. Along the street of facades is a Roman amphitheatre cut into the rock face, and even into some earlier tombs. The amphitheatre is quite eroded today, it looks extraordinary. 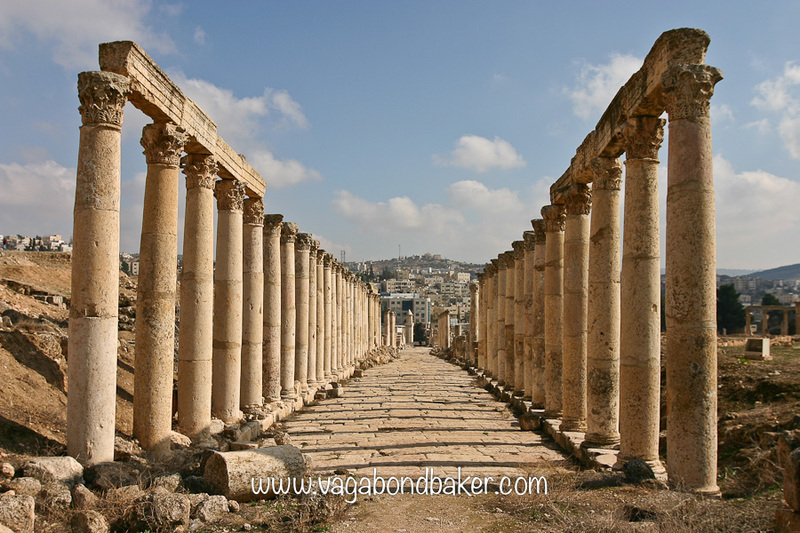 We had a look along the Roman main street then climbed up to the Monastery, Ad Deir, a half-hour steep hike high up in the hills above the city. 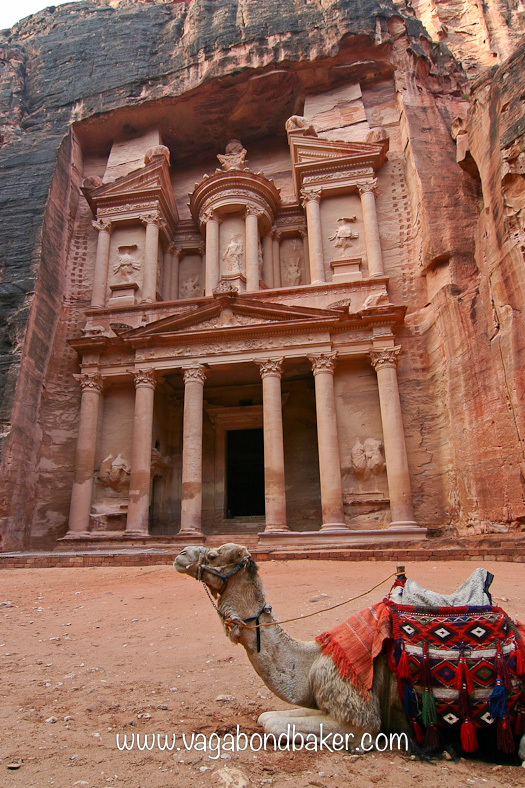 The Monastery is huge, Petra’s biggest monument. It is a remarkable thing to find at the top of a hill, it looks a bit like a giant version of the Treasury, it towers above you. We then walked up to the High Place of Sacrifice on the other side of the city, stopping at an attractive tomb complex, the tomb of the Roman soldier, on the way up. Here we met three friendly cats who followed us up the hill for a while. The high place certainly lived up to its name, you really feel up in the clouds and the views out are quite wonderful. It was cold and breezy as we investigated the sacrificial table cut into the hill top. A steep, rock-cut staircase transported us back down to the city. Exhausted, we made our way back out along the Siq. The Cave Bar, near the visitor centre made a welcome rest stop, it’s not often you get to drink a refreshing beer in a 2000 year old rock-cut tomb. We sat in one of the side tombs which was a little ghoulish. The next morning we set off for our second day exploring Petra accompanying Bill from Vancouver Island, who we’d met in the hotel the previous evening. The three of us walked for the second time along the Siq and headed for the ruined Byzantine Church near to the Roman street where we found some nice floor mosaics. From there we separated and Chris and I climbed up to the old crusader fort, high above the city. It was quite a precarious ascent with lots of steep steps, big drops and a few rickety wooden planks serving as a bridge. There was little of the fort remaining, mostly just bricks, perilously perched on rocky outcrops. From there we hiked back down and headed over to the side of the site we hadn’t seen yet. More impressive tombs and more rock-cut steps up to another high point. This one had a great view over the amphitheatre. 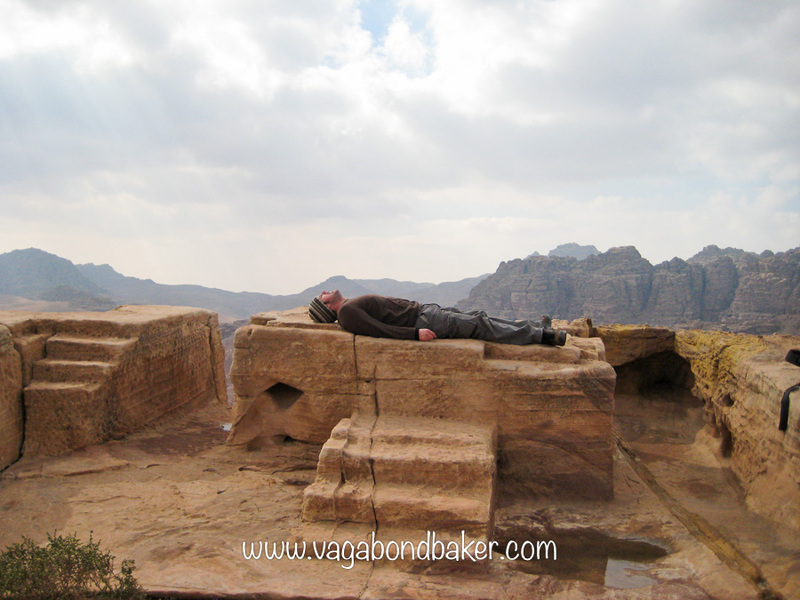 It was windy and trying to rain so we took shelter under some cutout in the rock face and had our lunch in this isolated spot above Petra. We spent the rest of the afternoon wandering around but the wet weather took a turn for the worst so we decided to head back. Another beer in the Cave Bar, this time with Bill then we all set off back to the hotel. Our ride didn’t turn up so a quick call the hotel and Mosleh, the legendary hotel manager, came and rescued us. We arose far too late the next morning to have any chance of catching the bus south to Aqaba, it turned out the bus didn’t turn up anyway as there was a lot of snow north of Wadi Musa and the roads were closed. This meant that everyone in the hotel was effectively stranded, we soon got to know each other! We all headed out for lunch and a few of us had a wander around Wadi Musa village, Chris and I managed to score some free baklava-style sweet samples in a bakery and, of course, bought a box! The bakery had an amazing flatbread machine mounted above the counter: the hot puffy breads seemed to fall from the sky onto the counter. By the time we returned to the hotel, the wind was howling. We all gathered in the lounge, grabbing blankets off our beds and huddled around Christine and Keith’s (wonderful Australian couple) tiny laptop watching Indiana Jones, the hotel DVD player wasn’t working. Chris had to narrate as we couldn’t hear it that well! That evening, we all clubbed our food together and tucked into cheese, biscuits, and pickles. It was great fun and wonderfully communal. No one was going anywhere the following morning either. Chris pulled back the curtains and let out a groan. 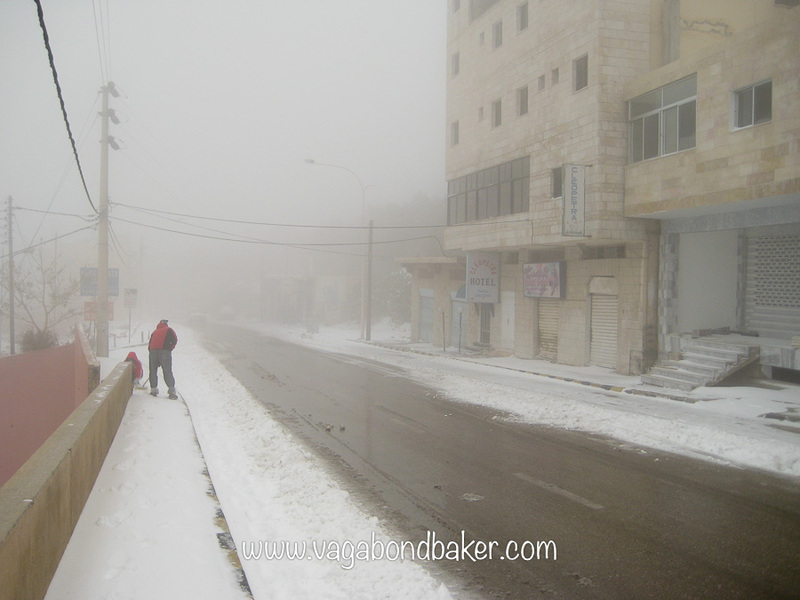 I peeped around and for a second I was filled with childish glee, Wadi Musa was under a thick blanket of crisp, white snow. Then the realisation hit home, we were well and truly stuck. Still, we made the most of it, Pete and Noreen (a fun Irish couple, who were holidaying in Israel at the time and had just popped over to visit Petra) were very enthusiastic to make snow men, so out we went into the street, wrapped up as best we could and set to work. We had no carrots or coal so we made snowman arms and eyes from some prickly pear we found growing nearby and used Chris’s keffiyeh to crown him. He was certainly a crazy looking snowman! It was fun watching the locals photographing him with their phones as they walked past‎ but he didn’t last long, some kids flattened him. Mosleh cooked us a veggie stew for lunch and we spent the afternoon sat around chatting. 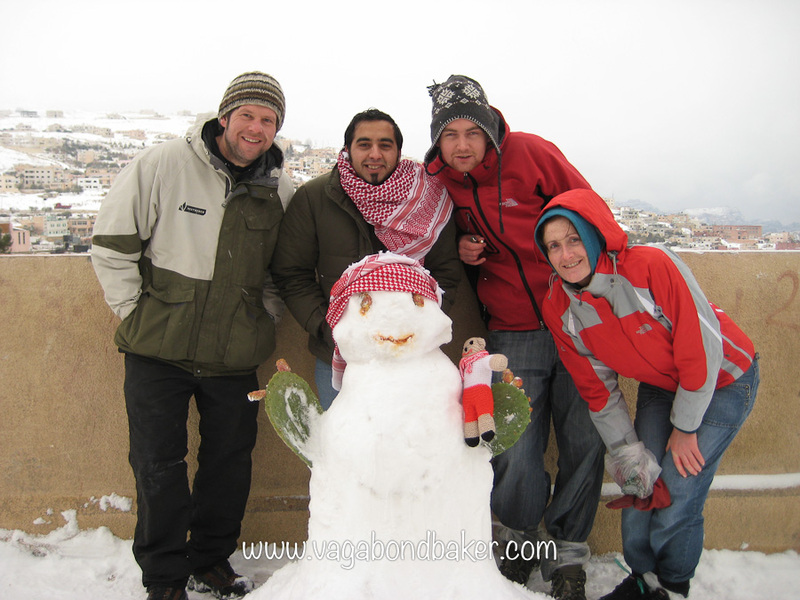 No one could visit Petra as it was closed due to the snow for health and safety reasons. A few people were going a bit stir crazy but I found it relaxing to not have to go anywhere or do anything. We all got take-out pizza for tea and later, Mosleh’s cousin Ali took us all down to a fancy bar in the village for a few drinks. We awoke to clear blue sky and sunshine; a hectic morning ended with Pete, Noreen, two French guys and ourselves in a minibus heading for the Red Sea town of Aqaba. Eventually we left the snow behind, the scenery was stunning: red sandstone mountains rose abruptly from the gently rolling desert. Aqaba was warm, really warm. After three weeks of traveling overland through the Middle East we were finally able to take off our coats! The afternoon was spent killing time in the sunshine before the evening ferry took us over the Red Sea to Egypt. It was quite a confusing procedure buying the tickets, paying boarding tax and getting our passports stamped. No one seemed to know when the ferry would actually be leaving. We joined a huge throng of people waiting at the gate at around 11pm. Eventually two coaches turned up and everyone had to squeeze onto them, we were then bused to the ferry. It seemed to take forever to board, the ferry was quite old and tired looking. We had to take a visa slip at a desk on the way to the lounge. We then had to go and get our passports stamped in the immigration room. Chris went first, then I went. It was rather nerve-wracking, I found myself in a long line of men, there were no women to be seen. Then the men started shouting at me, not aggressively but pointing, a man signalled for me to go to the front of the queue. Because I was a woman, I could jump the queue? Yes indeed! I had my passport stamped and was back in my seat in seconds! It must have been after 2am before the ferry finally departed, the lounge was bright and noisy, a tv blared loudly and there were of course the obligatory crying babies. The plastic seats were rather uncomfortable but I must have drifted to sleep at some point, with my coat over my head for darkness, as I woke to find the sun had come up on a new day. It was 6.30 am, we had arrived at Nuweiba, Egypt. Many of the photographs in this post were taken by Chris Hodgson. Thank you for such an interesting post; I had no idea that the cliffs at Petra were bands of different color rock like that! Wonderful photographs! Wow! That’s quite a story! 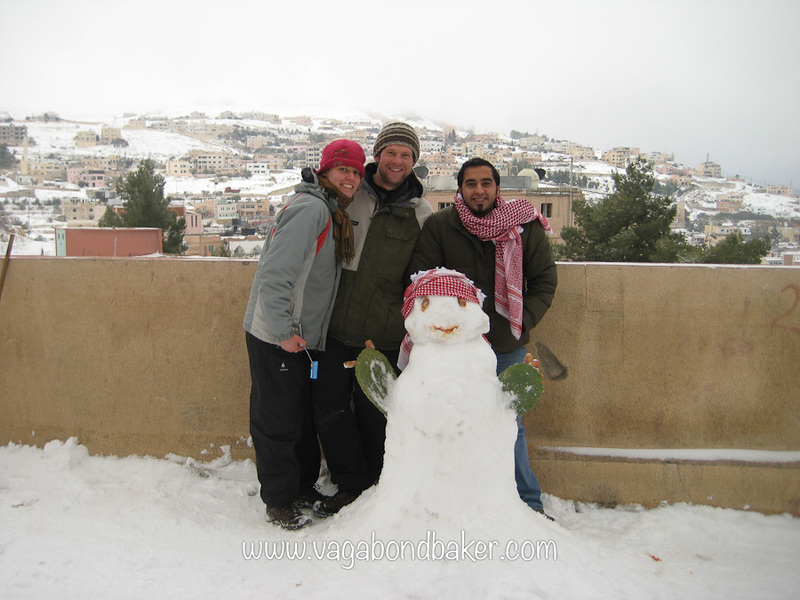 Stranded in Wadi Musa, sleeping on the ferry crossing the Red Sea to Egypt, broken down taxis, exploring Petra, making a snowman in Jordan, bagpipes in Jerash !! That’s a lot to tell. Wonderful posting, and it makes me want to visit all the more!